Please find below a brief update on the Halex Concert Society (part of the HPPG) and the concert dates for 2019. In 2018 the four concerts raised £3,277.93 of which 50% was contributed to the Julie Strelley-Jones cancer treatment fund. Sadly Julie passed away earlier this year but Julie and her family were very appreciative of the support given by local people. The other 50% was donated to the organ restoration fund for All Saints Church. The organ fund now has a total balance of £6,684.60 (including £1,229.40 held by the Church). The Halex Concert Society (part of HPPG) has arranged another four concerts at All Saints Church in 2019. The concerts are a mix of different genres covering jazz, pop, classical music and soul music, so hopefully there should be something for nearly all tastes. 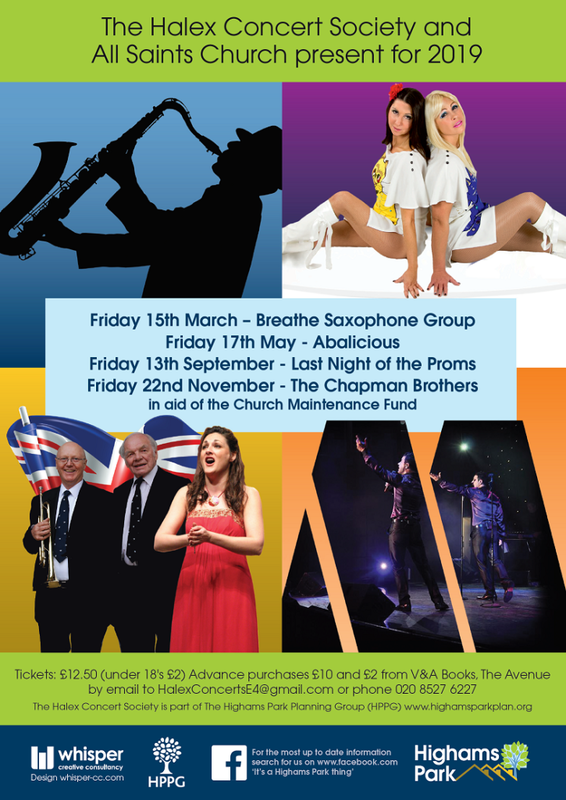 This year the net proceeds of the concerts will be donated to All Saints Church to support their fund raising campaign for the church hall and ongoing repairs to the church. Headline details and dates of the concerts that the Halex Concert Society will be presenting in 2019 are as shown below. More information will follow nearer the time of each concert. Friday 13th September: Last Night of the Proms with mezzo soprano Sophia Grech, Crispian Steele–Perkins and friends. Tickets: £12.50 (under 18’s £2.00) Advance purchases £10.00 and £2.00 from V&A Books in The Avenue, email to HalexConcertsE4@gmail.com or by phone 020 8527 6227.